From design, content, and marketing, to lead capture, SEO, and analytics – we’re a one-stop web development partner. Your website is a direct reflection of the professionalism and efficiency of your business. It is an around-the-clock billboard for your firm and the hub where your brand story is told, describing the key challenges that your business solves. Your website is central to your marketing as a doorway through which leads enter your sales funnel. We not only design websites, but optimize content and refine the user experience across devices. We integrate offers, calls-to-action, sales processes, and ensure protocols are in place for analytics, updates, and cybersecurity. We’ll work with you and your compliance team to ensure that all website content is approved prior to publicly launching your new website. Additionally, all Gate 39 Media websites have a built-in system that documents when changes are made to to a page on your website. This archiving system logs the website’s revision history automatically and earlier versions can be viewed and restored as needed. Why should I rely on Gate 39 Media to build my website? The Gate 39 Media team pairs deep financial industry knowledge with professional user interface design to create websites that are modern, that stand out from competitors, and that highlight your core services. Design is constructed with a clear focus on organized keyword-rich content, strategically placed calls-to-action for lead generation, and mobile responsiveness. Can’t I just build my own website using a website builder service? You could, but as a professional firm in a highly regulated and competitive industry, you’d be selling yourself short on many fronts. Out-of-the-box websites are not optimal for SEO; many services only allow for a single page, limited design options and website structure, and no room for custom integrations. With a website builder you cannot migrate the site if you need to, which means that you don’t own the site. The company that owns the builder service with does. Your clients want to know that you are a legitimate business that is willing to spend more than $30 on your online brand. When you go cheap, you get cheap. Every website Gate 39 Media builds is custom. We never use cookie cutter templates or take unnecessary shortcuts. Our thoughtful approach considers content, design, user experience, SEO, and lead generation. We’re able to integrate advanced technology and custom applications into our websites which are mobile-responsive, effective and beautiful. Additionally, our websites are backed by full service, training and support from Gate 39 Media. How do you take SEO into account in your designs? We develop all websites using basic best-practices for a search-engine friendly website. Our development patterns are based on our research, experience and results building websites specifically for the financial industry. 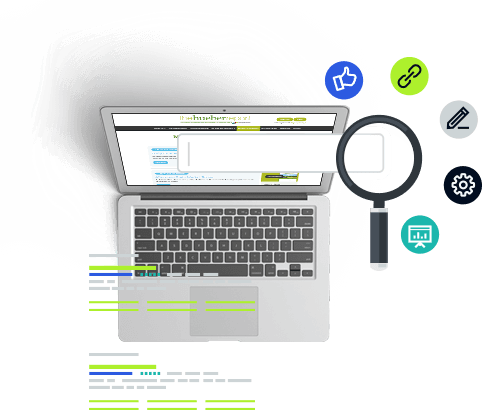 Our website development approach considers several factors that go into developing a search-optimized website, including keyword-rich content, proper coding and tagging practices, crosslinking, and other techniques. We’ll set up a discovery call to talk through your goals and needs and we’ll set a project timeline. After receiving any content, assets or notes from you, our design team will begin to wireframe and architect a design concept for your website. Once the concept is approved, the rest of the website will be designed, and the project will enter the development phase. Your website will be developed in WordPress within a secured QA environment. You’ll have the opportunity to review your website for final changes and you can then submit it to the NFA for compliance review. Once everything is approved, Gate 39 Media will then schedule your website for launch. What does your team use to build websites? Most of Gate 39 Media’s websites are built, managed and maintained in the WordPress Content Management System (CMS). Nearly 50% of the world’s websites are managed by WordPress making it the most popular and widely supported content management system in the world. With a WordPress website you can easily update pages and add modules and content, including streaming audio, video, additional blogs, and more. Where can I see samples of websites Gate 39 Media has developed? After building my website, can Gate 39 Media host my website, too? Yes, we can host your website for a low monthly fee. Your website will be placed on a cloud server and Gate 39 Media will monitor the performance and uptime of your website. Our hosting partner provides us with a 99.9% uptime guaranteed. Backups are stored both with the hosting facility and to an outside server per CFTC regulations. Additionally, minor changes to content, formatting, templates and other areas that may not be readily accessible are typically made at no additional charge for clients whose websites we host. Help! I need help writing website content and descriptions! We can help with this, too. Our deep financial industry knowledge and professional content writers can help craft your story and content concisely for the web. We can help write or edit your messaging and service offerings to clearly appeal to prospective clients while supporting SEO. What if I want custom quote feeds, subscriber-only content, or a back-end login for clients? Yes, we can do that. 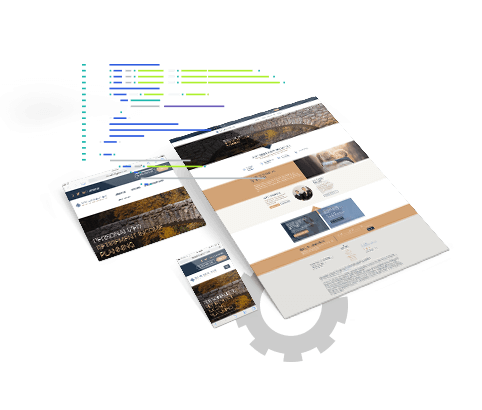 Our web development team has experience integrating advanced technical features, data feeds, portals, account statements, and more. Let’s discuss your specific needs. Will I be able to update my own website after it is built? Yes, and we can provide training and support materials to show you how. “I am so happy with the new homepage. We have been getting positive feedback and equally importantly, we have not confused our existing customers which is always the hardest part about launching a new design. You guys did a killer job!!! – Allison B., GFF Brokers, Inc.
Let’s discuss how we can help develop a responsive and compliant website that supports the goals of your firm.